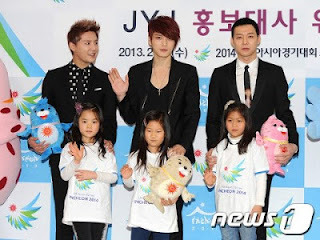 Hallyu trio JYJ pose for photos at the Lotte Hotel in Sogong-dong, Seoul on the 20th for the ceremony to commemorate their appointment as honorary ambassadors of the 2014 Incheon Asian Games. JYJ are planning to participate in the ‘Incheon Song’, ‘Incheon Dance’ and ‘Incheon Song’ music video for the Incheon Asian Games, and they will also be participating in the Incheon Asian Games road show in Hanoi, Vietnam and Guangzhou, China in October and November respectively. Regarding the sports matches they are interested in, Park Yoochun chose Taekwondo, Kim Junsu chose soccer and Kim Jaejoong chose table tennis and badminton. JYJ will be attending the 18th Presidential Inauguration on the 25th of this month and are also planning to participate in the ‘Incheon Song’, ‘Incheon Dance’ and ‘Incheon Song’ music video for the Incheon Asian Games. They will also be participating in the Incheon Asian Games road show in Hanoi, Vietnam and Guangzhou, China in October and November respectively. 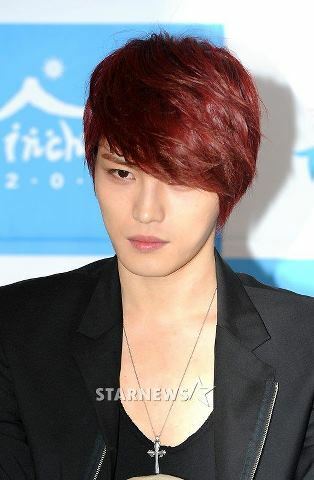 JYJ’s Kim Jae Joong recently talked how he feels about being an honorary ambassador for a state function. Kim added that he enjoys watching table tennis and badminton during the Asian Games. JYJ will participate in making music videos and songs for Asian Games and they will also join the Road Show, which will be held in October and November in Vietnam and China. although in the past they had many controversial news (conflict with the last agency when they were as TVXQ members), NOW they can prove to public that they can come back again as Hallyu Star who they had reached it before as TVXQ members.